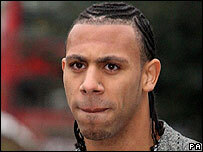 Premier League footballer Anton Ferdinand has been cleared of assaulting a man outside a nightclub. The West Ham defender admitted punching Emile Walker but told Snaresbrook Crown Court it was in self-defence, as he feared he was about to be mugged. The incident took place outside the Faces nightclub in Ilford, east London, on 2 October last year. Ferdinand, 22, denied a charge of assault occasioning actual bodily harm and one count of affray. The player's friend, Edward Dawkins, 28, was also accused of a similar offence and was cleared by the jury. During the trial Mr Dawkins, of Henry Adlington Close, Beckton, east London said he was defending a friend. Addressing the pair after the verdict, Judge William Kennedy said: "This was an unfortunate incident for you both which is now at an end. "You now leave without a stain on your character arising from it." The player's brother, England and Manchester United star Rio Ferdinand, watched the proceedings from the public gallery. After the hearing a spokesman for Ferdinand, Jerome Anderson, said the trial was a "traumatic and distressing time" for the footballer's family and friends. "For over a year Anton had to remain silent and read lurid headlines of wrongdoing. Finally he can give his own account in his own words," said Mr Anderson. "Anton made a split second decision to help a friend when a happy evening suddenly went wrong. This is the sort of person you need as a friend if you face danger," he added. The footballer admitted striking the first blow after Mr Walker, 22, "eyeballed" his £64,000 watch then threatened a friend, the court heard. But the jury was told no sooner had he been dragged away than up to 10 other men punched the "would-be robber" to the ground and kicked him repeatedly. The jury trying the player, from Mottingham, south-east London, took just 90 minutes to accept he was acting in self-defence. Jurors unanimously cleared him of assault occasioning actual bodily harm, affray, and alternative common assault and public order offences.